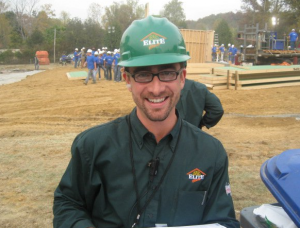 Lexington, Ky., January 5, 2011 – A muddy construction site at midnight is far from the traditional classroom setting, but for Lexington Theological Seminary student Joseph “Joey” Pusateri, it was the ideal place and time for furthering his understanding of ministry. It was October, and Joseph’s family’s business, Elite Homes of Louisville, was heading up the construction of a very special house—a home for the Lampe family, to be featured on Extreme Makeover Home Edition. The episode airs on ABC this Sunday at 8 p.m. EST. The construction of the house was a ministry in itself to the 32-year-old husband and father of two. In the months prior to the build, Joseph had been in a bit of a quandary. Joseph joined the family business in 2008 after moving to Louisville two years earlier. Neither he nor his wife, Jennifer, also 32, were regular churchgoers, but with their family growing, they sought out a home congregation. Joseph’s wife joined the praise band at Middletown Christian Church (Disciples of Christ) in Louisville, and Joseph soon followed in joining the church. Then in May 2010, Joseph began to sense a strong call to ministry. However, once Joseph set aside his fears and accepted the call to ministry, he knew it was the right thing to do. He just wasn’t sure how to attend seminary without disrupting the life his family had just begun to establish in Louisville. Joseph came across Lexington Theological Seminary during a web search. A friend, the Rev. Scott Cox, an LTS alumnus and pastor of First Christian Church-Georgetown (Disciples of Christ) also recommended LTS. As Joseph continued to research seminaries, LTS consistently stood out. The program offers two-thirds of courses for the Master of Divinity program online, with short, intensive courses at the Seminary. Other degree programs and certificates offered online are Master of Arts, Master of Arts in Pastoral Studies for Roman Catholics, Certificate in Pastoral Ministry, and Continuing Education. The Seminary’s Doctor of Ministry program is expected to follow online soon. Joseph was just getting started in the program when producers from Extreme Makeover Home Edition reached out to Elite Homes to build a home. Elite Homes also built a home for the show in 2007, before Joseph moved to Louisville. Joseph scaled back to one class for the month of October. He took his laptop to the job site and watched lectures and participated in online discussions with other students early in the morning, during breaks, and late at night. He recalled one night in particular when he was frantically searching for a WiFi connection among the mud and equipment so he could submit a paper before midnight. The home build required six weeks of preparation and five intensive days of nearly round-the-clock construction. The experience further fuels Joseph in his journey through seminary.